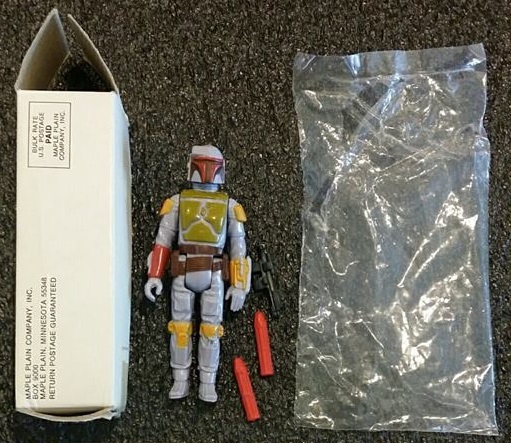 Collector's worldwide know the story of how the Rocket-Firing Boba Fett figure was originally intended to be a mail-in premium, but until this piece surfaced we have never actually seen the packaged version that would have gone into children's hands if the figure had passed Kenner's safety tests. 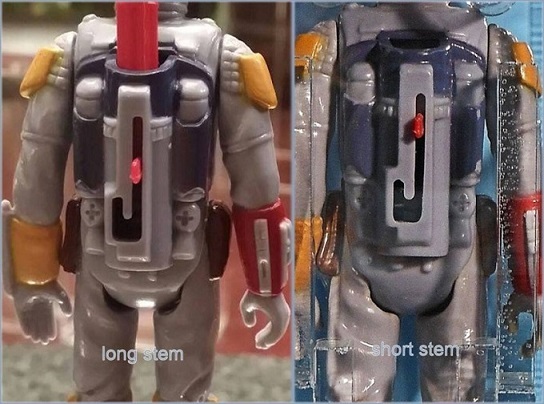 This late-stage prototype is known in collector's circles as the J-slot version because of the shape of the slot in the backpack. This final design iteration of the firing mechanism was still not adequate to pass Kenner's safety standards so they removed the feature entirely and, contrary to popular myth, it was not because of a death related to Mattel's Battlestar Galactica toy problems. The final blow to the RocketFett was that the slot itself could be broken resulting in a "sharp" that could damage a child's eye. Follow the J-slot link above for more information on that issue. The early promotional material for the Boba Fett began to circulate in late 1978, most importantly culminating in the creation of a sales brochure advertising the upcoming Jan/Feb 1979 Products. A lesser-known bit of information revealed in the catalog states that the figure would ship with 2 missiles and that is exactly how this sample figure was found. This early promotional material shows the early hand-made kit-bashed concept model of the figure. This design was quite familiar to children at the time since it was emblazoned on action figure packaging for awhile teasing an offer for a this new free action figure. 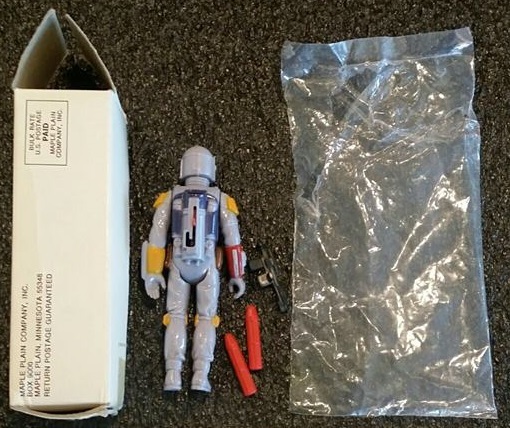 The figure seen here had been in the possession of a former Kenner Quality engineer since it was received from the factory back in 1978 and was purchased directly from him. Initially the engineer did not mention the significance of the mailer box, but he did note that it came with 2 missiles and a gun. As a great bit of physical provenance, he included a couple of his Kenner business cards noting 2 of his former job titles - Quality Control Engineer and Reliability Engineer. 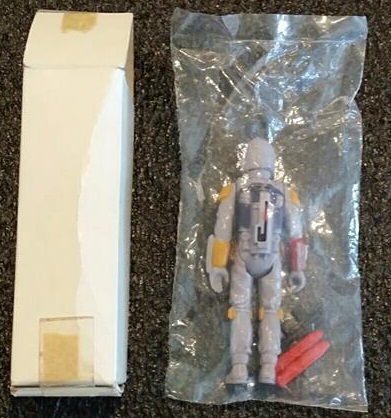 The mailer box appears otherwise identical to the released version, albeit missing an address label which would be expected and the baggie is of a plain type similar to this Engineering Pilot sample obtained from another Kenner source. 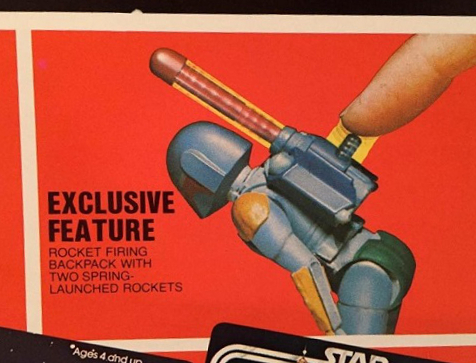 We can assume that if this missile-firing version had gone to production it would have the same baggie used in the Boba Fett mailer. We may also presume that an in-pack catalog would have been present and it's likely that Kenner also intended to include the notice about the character since he was unknown at the time. Perhaps instead of explaining that the missile firing feature had been removed, the other side of the notice would have described how to launch the missile. The missiles themselves are the correct 8-sided or 8-ribbed missiles typical to this stage of the prototype. When the missile-firing feature was removed the missile design only changed slightly with the addition of a small fin at the bottom which acted as a mechanical locking feature inside the backpack when it was being sonic-welded into place during the manufacturing process. An interesting observation that came to light with this find was the fact that 2 different length stems can be found in the J-slot design as seen below. Because of the appearance of the other molded features in the backpacks we can see that at least 2 different molds were used to create these prototypes. Even though a sample mailer exists, it should still be stressed that no missile-firing figures were ever mailed to the public. Many, many more steps in the process would have had to occur for the figures to be manufactured and distributed so there was no way even a sample could have been mailed to consumers. The final products were shipped from the Asian toy factory to Kenner's distribution center then they would have been sent to the outsourced fulfillment center in Maple Plain, Minnesota - a name quite familiar to the Star Wars generation of kids that waited weeks for their collections of Proof of Purchase seals to turn into free figures in little white boxes. Boba Fett made his television debut in November 1978 in the Star Wars Holiday Special but would not make his screen debut until May 1980 with the release of The Empire Strikes Back. Until that time the only brief glimpses the public got were largely this action figure, but the childhood heartache over the missing action feature reverberated for decades to follow.